Even safety-focused drivers with impeccable driving records can end up being charged with a traffic violation. If you have been cited with a moving traffic violation and would like to learn more about your rights to fight the citation, the best place to start is to speak with an experienced Traffic Ticket Attorney in your state. Being charged with a moving traffic violation often results in an increase in your automobile insurance premium, which is just another reason for why you would want a Traffic Ticket Attorney to assist you with a traffic violation charge. Traffic court is a municipality’s specialized judicial process for handling traffic ticket cases. Certain states give a person the option to request a Trial by Written Declaration (California, Florida, Hawaii, Louisiana, Nebraska, Ohio, Oregon, and Wyoming). While some traffic violations, such as parking violations, are civil matters involving a vehicle’s registered owner, moving violations are charged against the actual driver. It is important to note that moving violations enforced by automated camera enforcement may be prosecuted as civil violations against the vehicle’s owner. 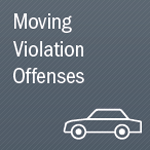 Moving violations are usually classified as infractions or misdemeanors, but more serious moving violations (hit and run, Driving Under the Influence, road rage, aggressive driving) can be considered felonies. Moving violation citations typically require payment of fines, possible points added to your driving record (if state-applicable), re-education, increased auto insurance premiums, and/or retaking of driving tests. Each state has different traffic violation laws and depending on your state’s laws you can be at risk of fines, arrest, a revoked license, imprisonment, and other penalties if you are found guilty. Alaska, Arizona, California, Colorado, Connecticut, Florida, Georgia, Illinois, Indiana, Kentucky, Maryland, Massachusetts, Michigan, Missouri, Nebraska, Nevada, New Jersey, New Mexico, New York, North Carolina, Ohio, Pennsylvania, South Carolina, Texas, Virginia, and West Virginia. Moving violations can affect the status of your license, increase the cost of your car insurance, and more. Fines for moving violations can vary widely between jurisdictions for the same behavior, usually falling between $25 and $1,000 per moving violation. In most places, moving violations involve fines which must be paid as well as punitive points (depending on the state). As a driver accumulates points, he or she may be required to attend defensive driving lessons, retake his or her driving test, pay additional taxes, or even surrender his or her license. Additionally, drivers with more points on their driving record often must pay more for car insurance than drivers with few or zero points. Most serious moving violations, such as Driving Under the Influence (DUI) and reckless driving, may result in arrest. If you have been cited for a moving violation, a qualified attorney can often succeed in reducing the severity of the offense and/or reducing the fine or punishment meted out by the court. If you believe you have been cited in error, or if there are circumstances that may influence the outcome of your case, an experienced traffic attorney can advise you how best to proceed. Contact LegalHelpLawyers.com today for legal assistance with moving violations!